The set includes sectional, ottoman, and cocktail table. Made of rust free aluminum frame with resin wicker. The reversible cushions are made with durable beige color Nuvella™ solution dyed polyester fabric with brown accent piping. The table has wood look resin top. 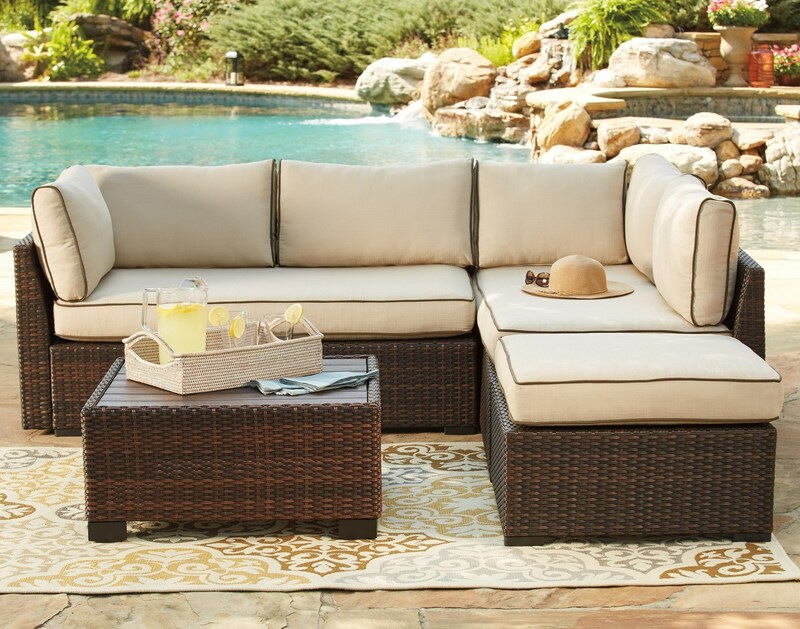 LAF loveseat 90.50" x 58.00" x 35.50"
Ottoman 26.50" x 26.50" x 17.75"
Cocktail table 29.75" x 29.74" x 14.25"
The Loughran Outdoor Sectional Set with Cocktail Table by Signature Design by Ashley from Boulevard Home Furnishings. We proudly serve the St. George, Cedar City, Hurricane, Utah, Mesquite, Nevada area. Product availability may vary. Contact us for the most current availability on this product.